“I discipline my body and bring it into subjection, lest, when I have preached to others, I myself should become disqualified” (1 Corinthians 9:27). Holidays used to be SO stressful for me in the area of FOOD! I dreaded parties because I knew I couldn't control myself. One decision that changed my life was in the area of how I think about food. I used to live with a diet/deprivation mentality. Maybe you’ve done that, too. You know, living on salads with vinegar and diet soda to lose weight, and rarely eating any fats since no-fat diets were all the rage. And then did you switch to little-to-no carbs when that diet was in vogue? Yeah, me, too. Chronic dieting has affected countless numbers of people. Many have found that their thyroid, adrenals, metabolism, and relationship with food have suffered from that kind of diet and food deprivation mentality. I made a decision some years ago to make a change. I decided to start eating and enjoying whole foods, not diet foods. I enjoy helping people see that they can have abundance eating and enjoying foods as God created them, and “ditch” the diet mentality. By eating this way many report they experience far less digestive upset, a lessening of inflammation in the body, and almost effortless weight loss. My holiday survival tips are tips for you are ones you can actually use every day of your life. 1. Allow Yourself to Enjoy Celebrations. If you want to have some chocolate, then by all means treat yourself to some. All too often, when we continually say “No” to ourselves, we find ways to make up for it later, many times by overeating the good foods (instead of allowing ourselves a small, sweet treat). Instead, allow yourself to have that sweet treat and balance it with a fresh veggie juice or a glass of lemon water to alkalize your digestive system. 2. Be Alert…and Relax. Holidays can be stressful (I can hear you saying, “Tell me about it!”). When we stress, our cortisol level rises and our body goes into “fight or flight mode,” which God designed to help us when confronted by danger. We only want to experience this in emergencies. The problem is that many of us are reacting to stress this way in everyday life, and it takes its toll on our health. Here is a simple thing you can do which absolutely works. If you are feeling stressed, then take one minute and excuse yourself from the event, dinner table, or holiday party and find a place where you can do some gentle deep breathing for a minute or two. At the same time, meditate on a favorite passage from Scripture, such as the 23rd Psalm (“The Lord is my Shepherd, I shall not want…”). This will help reset your nervous system and you will feel calmer. Choose to cast your cares and burdens over on the Lord and determine to rest in Him instead of carrying all the care and responsibilities on your own shoulders. Ask Him to help you. Ask Him to guide you to people who will be a blessing to you—to help you, to pray with you, to be a friend and supporter to you. 3. Choose Life by choosing to delight in the holidays! I used try to be perfect, but I’ve come to realize I cannot be perfect in this world. I can, however, recognize that I serve a perfect God who loves me perfectly. And the Word of God says that “perfect love casts out fear” (1 John 4:18). So, there’s nothing for us to fear. Ask the Lord to love others through you and help them to feel God’s love. Hallelujah! 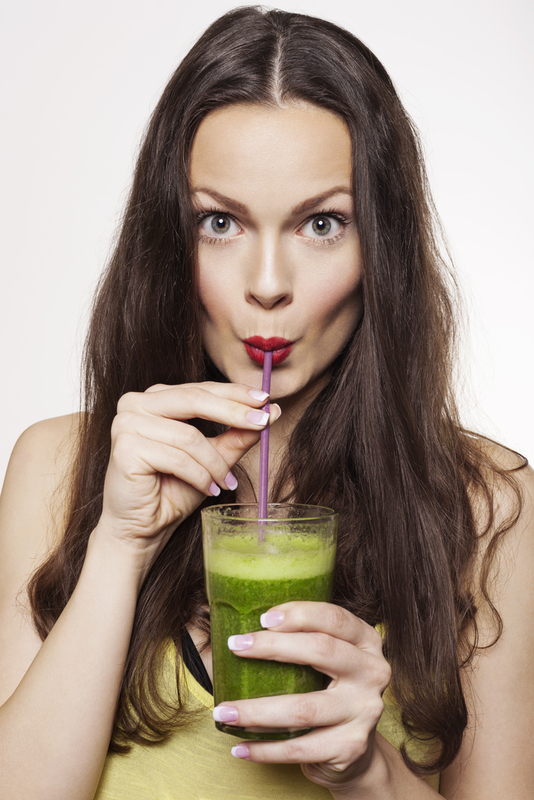 Here are a few simply delicious and healthful recipes the whole family will enjoy! 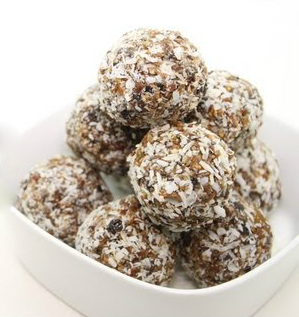 Combine all ingredients (except for shredded coconut & optional berries) in a food processor. If you want a sweeter batter, add an extra date or the honey. Pre-heat oven to 350 degrees. Cut acorn squash in half. Fill a roasting pan with 1 inch of water, and place squash flesh-side down. Roast 45 minutes to an hour, or until very soft. Scrape out seeds and discard. Sauté onion, celery, carrots, mushrooms, sage, and thyme. Remove from heat. Stir in salt and pepper, dried cranberries, mixing to combine. 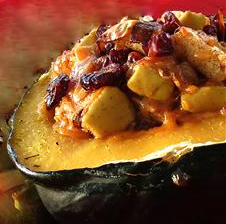 Divide the stuffing evenly among the acorn squash halves. May God richly bless you and your family this Holy-Day Season! 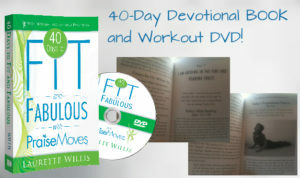 Check out Laurette’s book & DVD set from Destiny Image Publishers: “40 Days to Fit & Fabulous with PraiseMoves.” Christian Fitness Expert and Certified Health Coach Dr. Laurette Willis is the Director of PraiseMoves Fitness Ministry with DVDs, Training, and Classes by Certified PraiseMoves Instructors on six continents (http://PraiseMoves.com).